In memory of ALL the casualties of war. In 2010 Australia is a compliant military servant to the United States of America. More than ever before, we are a reliable component of US global military machinery. We have been at war in Afghanistan since October 7 2001 – more than 9 years. We are part of a US led “Operation Enduring Freedom”. We expect to stay at war in Afghanistan for at least one more decade. Looks more like Operation Enduring Futility. Have we achieved a state of permanent war? In 2010 the ADF is armed, organised, and trained to fight as junior partners with the US in wars of aggression around the world. The USA now has “access” to ALL ADF bases and facilities. Australia provides R&R, storage, and logistics support for the US Navy, Air Force, and Marines operating around the Indian and south west Pacific Oceans. Australia gives unqualified political support for US military aggression in Afghanistan, Pakistan, and potentially Iran. The US has exceeded the limits of its economic and military power, but Australia is a loyal servant. In 2010 ANZAC Day has become an expression of nationalist military pride. The ANZAC story has been revised to suit the US empire. “Our boys” died for “Freedom”. “Our boys” are dying today for “Freedom”. The Afghan men, women and children are dying in their thousands – apparently also for “Freedom”. ANZAC Day has become a lie. 100 years ago, Australia and New Zealand were rustic outposts of the British Empire. We celebrated a common heritage and culture, and we shared a colonial experience. We enjoyed parliamentary democracy and the rule of law. When our young men were called to assist in the military defence of Empire over in Europe they experienced together the murderous folly of industrial warfare – with among other things the first use of chemical weapons and aerial intelligence. It was hell. It was also a wake-up call exposing the myth of empire. It was a foundation of emerging self-reliance. The surviving ANZACS returned from Gallipoli and France with a warning to avoid war. One purpose of the original ANZAC Day was to remember the soldiers who’d been put through hell, and to dedicate our country to ways of peace. No more war! Today, our cousins in New Zealand have very nearly abolished their military defence forces, won’t allow nuclear warship visits, and fight in far fewer US imperial wars around the world. In contrast Australia has never been so heavily armed, or so aggressive. Australia must now be counted as a militarist state, but it is no longer ANZAC. The ANZAC liturgy is a corruption of Christian teaching. Every ANZAC Day, war is given Christian legitimacy through the use of John 15:13 When a soldier “lays down his life” for the sake of his comrades on a field of battle, he is said to have made a sacrifice equivalent to that of Christ at Calvary. That is a perversion of Jesus’ revelation. Which is not to say that soldiers can’t exemplify the graces of courage and comradeship on the field of battle, sacrificing one’s own life for that of friends, family, or innocents. Simpson and his donkey ambulance comes to mind. But the full message of redemption through sacrifice can’t be understood from a single line of scripture stripped of all context. John 15:12-14 expands on the purpose of Christ’s sacrifice. “This is my commandment, that ye love one another, even as I have loved you. Greater love hath no man than this, that a man lay down his life for his friends. Ye are my friends, if ye do the things which I command you”. Love one another, even as I have loved you. The whole purpose of Jesus’ crucifixion is the redemption of humanity. Jesus sacrifices not to punish the sinners, but to channel God’s forgiveness and redeem them. To love them, at the cost of his own life. Jesus exhorts us to do the same. To love one another, to love our enemies. If nation is warring against nation then Jesus’ commandment has already been refused, and we are guilty of idolatry, worshipping military technology. The personal grace and courage of the soldiers does not justify the evil of their political leaders. Times change. While the ANZAC legend was being formed there was an active peace constituency in Australia. The Suffragettes, the Catholic church, and the Labor party organised to refuse conscription for WW1. ANZAC Day was as much a popular outpouring of grief, pride and resolve to honour the sacrifice of young Australian men who died, as it was a government initiative. Today we have instead the theatre of pro-war spin, and an ANZAC Day wholly captured by government. The recent announcements about the revised Australian/US Alliance was timed to coincide with remembrance Day. ANZAC Day 2011 will see a further eulogising of our commitment to our war in Afghanistan. Times change. The state used to need our participation in war. Then they needed our consent. Today, in the age of media spin and drone bombardment, all they require is our silence. We need to reclaim ANZAC Day, and turn it back to the memory of the ANZACS. Starting in 2011 there will be a new citizen initiated component of ANZAC day. An ANZAC EVE VIGIL will run from sunset to dawn on ANZAC Eve at the cenotaph or the ANZAC memorial in each city and regional centre which participates. There will be a vigil at the Australian War Memorial in Canberra. 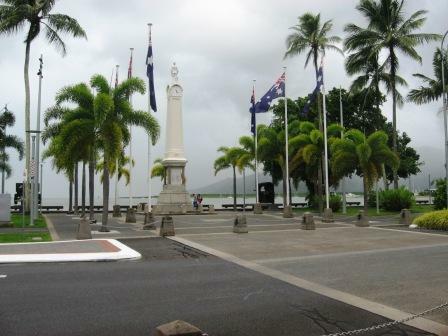 Peace by Peace will be organising a vigil at the Cenotaph in Cairns. Vigils will be candle-lit with lanterns designed by Graham Dunstan. There will be some liturgy and contemplation of John 15, and consideration of what it means to love one’s enemies. ALL the casualties of war will be remembered – the men, women and children, the social and environmental health, of all the parties. The 24th April is not just ANZAC Eve, it is Kapyong Day – the Korean War Vetran’s Day. 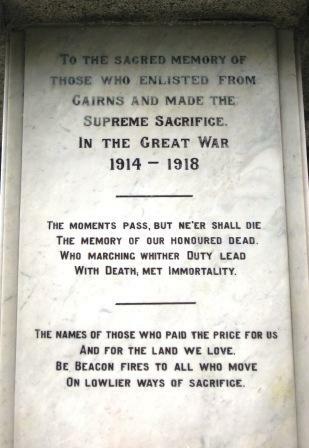 In respect of this day – I suggest you do not conduct your activity at the Cenotaph.